A quiet drink on the balcony with friends. It’s the simple things that are often the best! 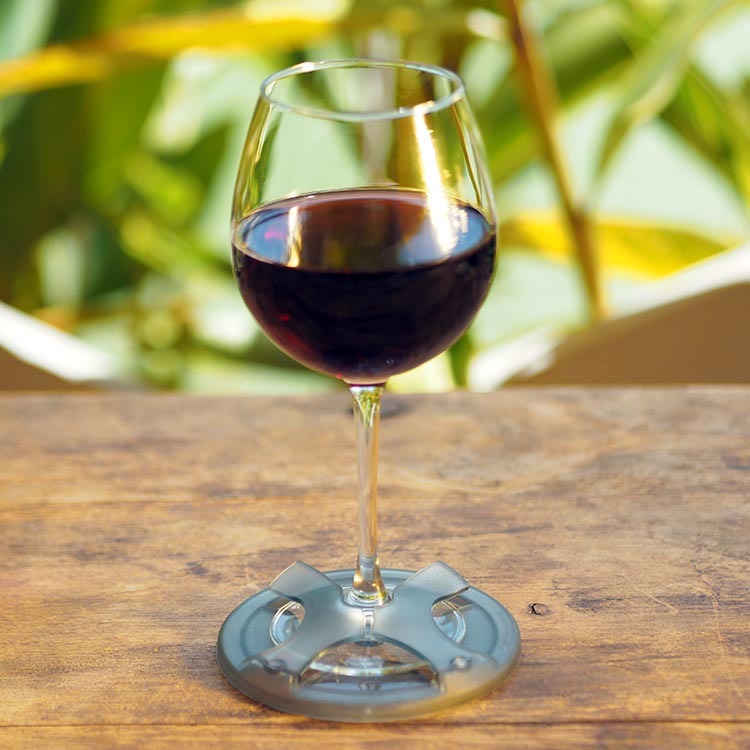 The slide on base that stabilises your wine glass outdoors. great on outdoor furniture, grass and sand. Also brilliant when the wind picks up. 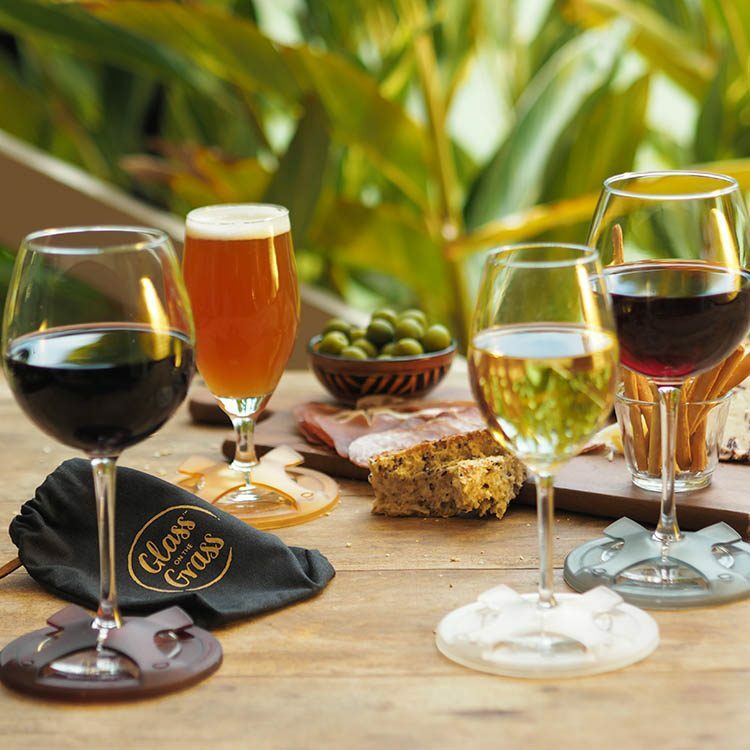 This pack of four Glass on the Grass™ wine glass bases comes in a stylish charcoal drawstring cotton linen bag. The shades in your pack are Smoke, Ice, Amber, and Pinot. Please ensure you have read our FAQ, Shipping and Product Information below. Will they fit my wine glass? 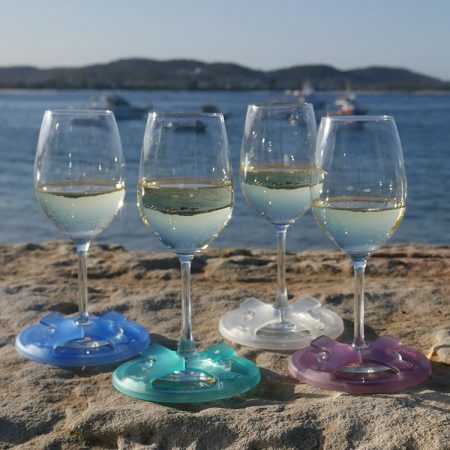 They are designed to slip onto the base of most standard wine glass. They are not designed for glasses with very small bases or thick stems or glasses that are especially tall. 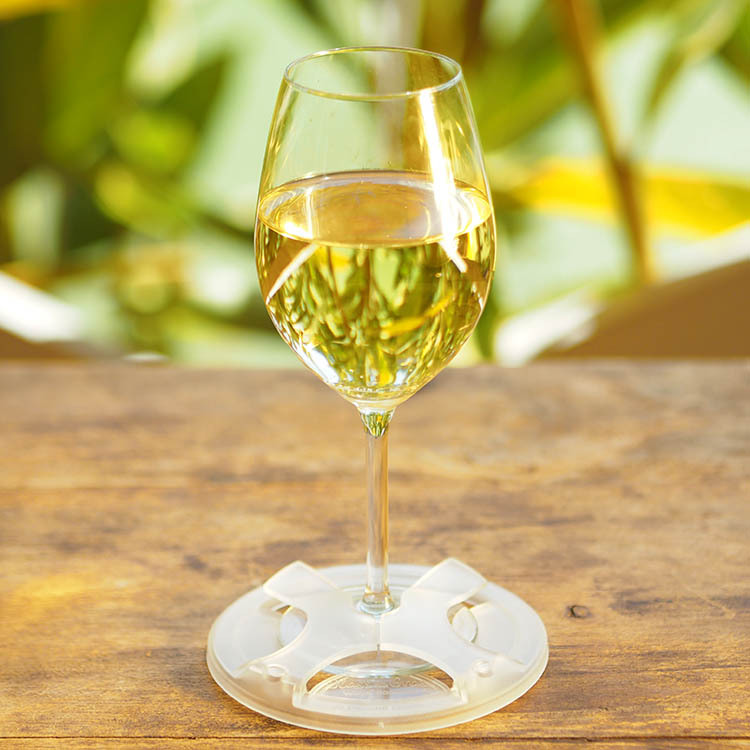 It is important that you follow instructions when putting it on your glass to ensure glass sits flat inside the wine coaster base. The choice is yours, it was designed to for glass because we hate drinking out of plastic but there are times when plastic is best. 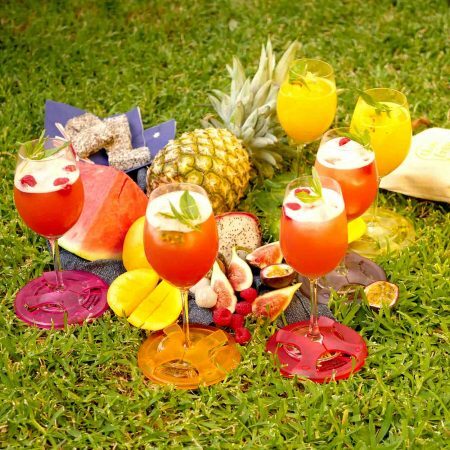 If you are around water we strongly recommend you use our base with plastic glassware. 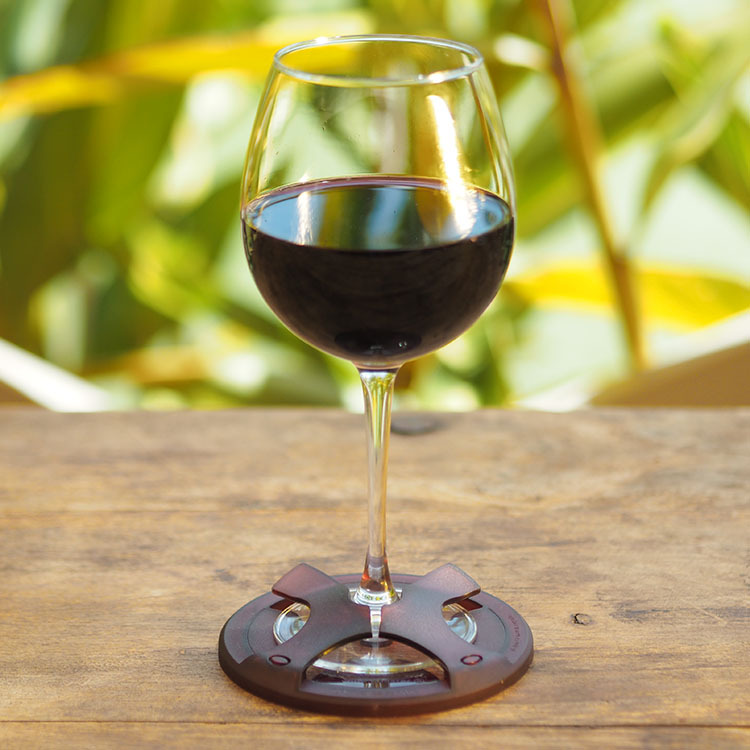 The product is designed to reduce the chance of your glass tipping but it does not guarantee it. After use, slip it off your wine glass and wash in warm water using dishwashing liquid. Is it food safe and recyclable? Yes, Glass on the Grass™ is made from It is food grade, BPA free, and recyclable K-Resin. Wash in warm water using dishwashing liquid. 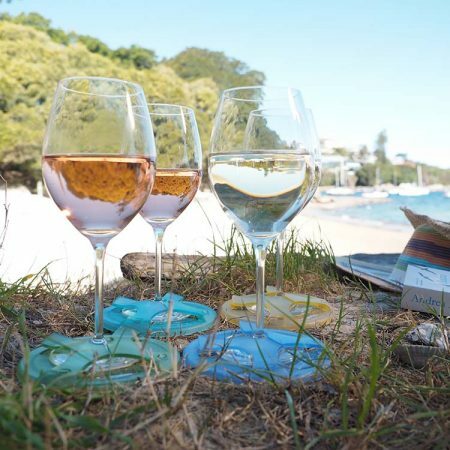 Glass on the Grass™ is designed and made in Australia by an Australian company. Our brochure is printed in Australia. Our bags are made in China. As strong advocates of reducing waste Glass on the Grass ™ comes in a reusable bag, perfect for storing and transporting them. When not in use keep out of direct sunlight to reduce colour fading, which may happen over time. Why do they look lighter or darker in some photos? Please note there may be variation in depth of colour due to our small batch boutique production and lighting conditions during photography. PayPal and Debit/Credit Card. Please note that you do not need a PayPal account to make a credit card payment. We’re delighted to offer free postage for all Australian orders over $100. All other Australian orders will incur the standard Australia Post charges. All international orders will incur the standard DHL charges, these will calculate when you complete your shopping. All prices in AUD. We do. We designed Glass on the Grass for outdoor lovers the world over! Please note local customs and Duties will be payable by you. How soon will my order arrive? Our shipping date varies per item. Once the item is dispatched you will receive a confirmation email with your tracking number. Please email info@glassontegrass.com if you have further questions regarding your order. 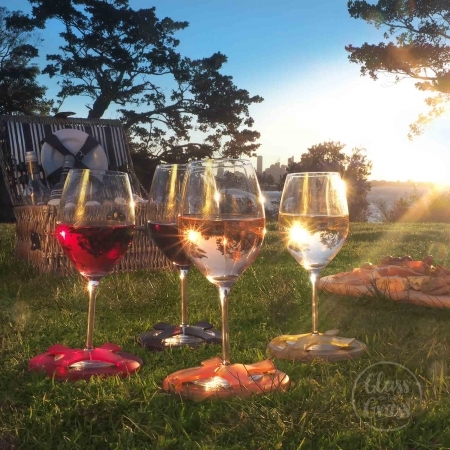 We’re pretty sure your Glass on the Grass bases will become one of your favourite accessories but if you are not happy with your purchase we offer a 30-day money back guarantee. See Terms and Conditions of Sale here and Product Disclaimer here. What happens if the item I receive is faulty? We pride ourselves on producing a high-quality Australian made product. Be assured we will make replacing your item a priority. Refer to details here. 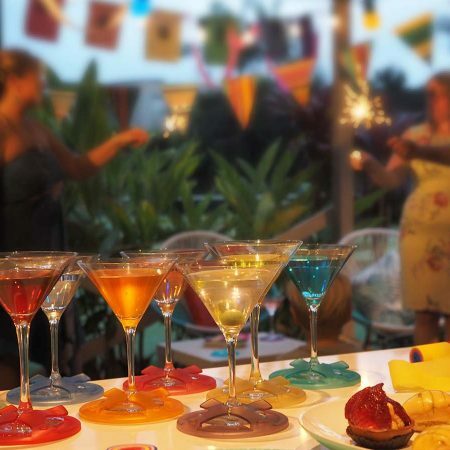 Great product as I bought this for a big family function I was having in my backyard – the guys are always kicking over glasses and it really did the trick. The home brew was secured by Glass on the Grass. Thanks for inventing a great product. Perfect gift for the guy who has everything! 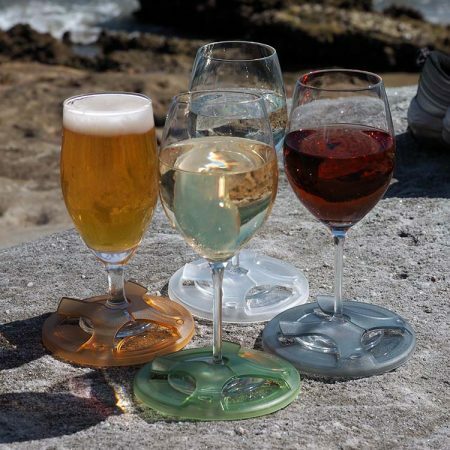 Great that they can be used with not only wine and cocktails, but beer too. Thanks Glass on the Grass for an excellent product. Thanks, Trish, we’ve been getting a lot of positive feedback from women who have brought their partners a Gentleman’s pack. So glad your partner loved it!